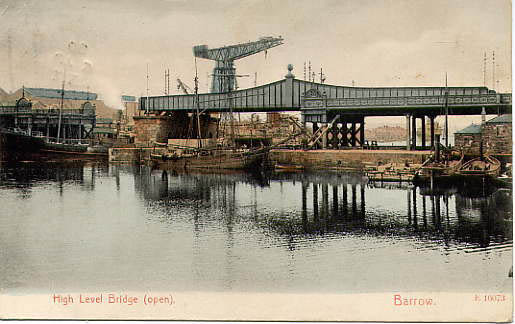 Tommy Burns dived from the High Level Bridge at Barrow-in-Furness on 9th July 1890, four years after the bridge was built to connect Barrow Island – then a separate island – with the mainland. Tommy Burns, of Runcorn Bridge fame, dived on Tuesday from the high-level bridge at Barrow-in-Furness. The feat was accomplished at half-past one, Burns being disguised as a workman. Tommy Burns posed as a workman to dive from the High Level Bridge.